I remember my father‘s sacrifice on Remembrance Day. Dad’s name was Cecil McQueen, Mac or McQueen to his friends. 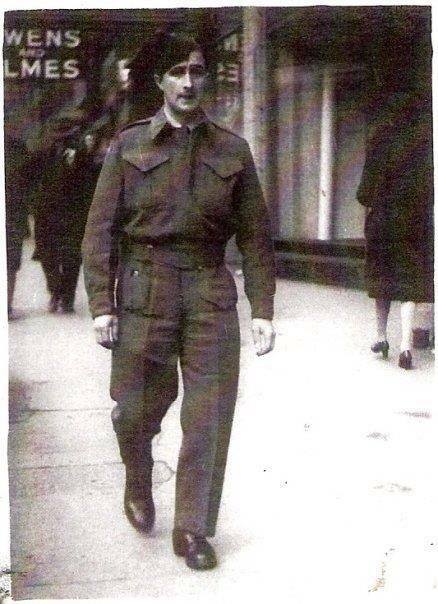 My Dad lost his leg during the 2nd World War, so Remembrance Days are always unsettling days for me. As a child, one of my earliest memories was playing on the floor by my father’s bed. Dad was sitting on his bed in his underwear and I noticed the holes that were in his leg and even in stump of the leg that he had lost. I can’t remember, I think there were 10 holes, 5 would have been entry wounds and the other 5 the exit wounds. There would have been 2 more holes that I wouldn’t see, they were from the bullet that hit his left leg and shattered the bone, and which eventually caused the loss of his leg. Looking at those wounds as a child meant little to me, he was my dad, I only knew that there were things that my dad couldn’t do because of the loss of a leg. I was too young to realize that those holes represented a time of horrific violence that he suffered. He spent almost three and a half years in the hospital as doctors tried valiantly to save his leg. The attempt was over when his leg contracted gangrene and they had to remove his leg or the infection would have taken his life. It was years later when I heard the story. He would never tell his son, a 5 year old, that after he was shot so many times because 2 German machine guns had been set up in that field, behind 2 stucks of grain, and when he was seen to be shot so many times, it was thought that he was killed and his companions on the mission left him for dead. He was dead, so with the danger still there they would come back for the body tomorrow. Only, he wasn’t dead and he lay in the field in a pool of his own blood for a day and a half before the medics got to him. Mercifully his body went into shock, the blood went to the trunk of his body so he didn’t bleed to death, and he said he didn’t feel much pain until shortly before the medic got to him. He was a Corporal and had been on a reconnaissance mission for a superior officer, to scout out some area when he and the 2 men assigned to him came to an open field that had grain cut and the stucks of grain were piled high to dry in the air before the thrashing was to begin. They crouched, looking over the field to assess the danger danger in crossing the field. It was Dad’s decision to make, who would be be the first to venture out onto the field. Dad could not live with himself if he sent one of the other men across the field and either one of them were killed, so he began across the field himself. The assessment was correct about the danger. Two machine gun turrets were set up on either end of the field, and as my father crossed the field the both open fired and both hit him. This is the unsettling part of Remembrance Day. It is always the war dead that are mentioned and honoured, there is never any mentioned of the men, or women that lost limbs, their minds, or worse. What my dad did in crossing the field himself, was an act of heroism. He paid the rest of his life for that one kind decision. And the payment was very high sometimes. One employer was angry with him when he stood up for another employee, the employer, angry at him told him, “When you came to work for me, I only hired you because I felt sorry for you. You are not a man, you are only half a man. I was sixteen at the time. I had never seen my father cry before, it was disturbing to my core to see the man, who taught me not to cry, crying. Let me get very personal here. Here was a man who had been a very good athlete, as a young man he had won metals for swimming, and played baseball and soccer on very good teams. He was a sparing partner to a champion Canadian Featherweight boxer. All this, so it must have been brutal for him to loose a leg. It is crushing to me just thinking what he must have felt when he was told he would have to loose his leg or he would have died. With so much of his identity wrapped up in his athletics I am not sure how he did it. I lived with him, I saw his everyday struggle with the lose of his limb and the struggle it was to have me, a boy, do things for him that he could not do for himself. I witnessed it all at this end I’m am not sure I would have allowed them to take off my leg. Some would look at it taking great courage just to cross the field with what he suspected, but I think that it took greater courage just to live with his sacrificed limb every day of the remainder of his life. Life is demanding, and sadly, sometimes very, very cruel. Sometimes you make a decision with your best self, but the rest of your life you have to live with that decision. In the moment of living with a bitter reality, in a sorrowful moment, in the perfect realization of the consequence you have to bear the rest of your life, you hold the truth before you; you turn it to see all sides. You just stare, because as much as you wish you could change it, you cannot. In the stillness of the night I wonder if he had to do it again would he even have volunteered to go to war. If you liked this blog, please pass it on. This entry was posted in Uncategorized and tagged History, losing limbs during war, lost his leg, my dad had lost his leg, Remembrance Day, Toronto, war hero, Wars and Conflicts, World War II. Bookmark the permalink. Thank you for your comment. Dad was a wonderful man. I realized more of what a hero he was the older I got. When young we didn’t think about that so much. He was a humble man and never bragged about what he did. Like any true hero he just thought that it was the right thing to do and wouldn’t have done any different if he had the choice to make later in life. Yes I was fortunate in having a wonderful Dad. In respect for him and his quiet humility I want the memory of his sacrifice alive. Thanks Ruby. Dad also threw his artificial leg away. The leg hurt his stump and he also didn’t want to add to the phantom pain he already felt. Those men suffered a lot from the sacrifice they made. I am very happy you enjoyed the blog and thank you for your comment. I also thank you for being such a good friend to my Mom.